The development of affordable storage solutions for solar power or other renewable energy sources such as wind will change the nature of electricity generation and distribution as we know it. Most people think of wind and solar power storage (usually in the form of batteries) as a technology primarily for use in off-grid/stand-alone solar power systems. However, a growing number of companies are now offering increasingly intelligent solar power management and storage solutions–both for the residential and commercial solar power markets. The future of electricity generation is likely to veer away from the current model of centralised power production and distribution. Renewable energy technologies such as rooftop solar, which can be connected in a decentralised, ‘distributed’ way throughout the electrical grid, have the potential to transform the way we think about and generate power, with massive potential savings in store for homes, businesses, and electricity generation/transmission infrastructure as a whole. Traditionally, battery banks have been a technology only used primarily in solar power systems that are not connected to the electrical grid. The reason for this is fairly obvious: Off-grid homes need reliable power even at night, and solar panels are generally the most cost-effective way to generate it, but cannot provide on-demand power unless the sun is shining, which may not necessarily be when it is needed most. The solution is therefore to capture it in batteries which can then be drawn upon later to provide power. With grid-connected solar systems (which are these days by far the more numerous type), batteries are not necessary because the electricity grid functions as a kind of bottomless battery bank. Additionally, the cost of storage technology can be prohibitively high (although this is changing), making it quite unattractive for those who have the option to simply buy relatively cheap electricity from the grid. This dynamic is changing, however, with the price of retail electricity rising across Australia, and the price of solar PV systems also dropping rapidly. Why opt for power storage with a grid-connected solar PV system? It is helpful to think about a battery bank for an off-grid system as equivalent to the electricity grid for a grid-connect system. Due to the the individualised nature of battery banks (as well as the comparatively small scale of their industrial production), it is not yet possible for them to achieve the economies of scale that enable grid power to reach its relative level of affordability. This is why most households and businesses with grid-connect solar power systems don’t bother to install battery banks–when it’s more affordable to simply purchase power from the grid, why would anyone bother to opt for a storage system? Having a battery bank for a grid-connect system only makes sense if there is a way that the battery bank can be drawn on when it is advantageous for the system owner–usually during electricity peak rate periods of the day, when grid power is at its most expensive and the sun is not shining. Taking this factor into consideration creates a more complex dynamic than the traditional off-grid system, where the inverter-charger/system manager ordinarily needs only to ‘choose’ between solar power or the battery bank. 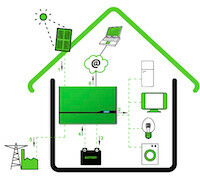 In order to get the most out of a grid-connect system that also has an energy storage system (as distinguished from a simple battery bank for an off-grid system), however, the management software has to be ‘smarter’ and–ideally–programmable. Why programmable? Incentives for solar power generation differ from state to state in Australia, encouraging different patterns of electricity consumption timing. For example, if you have a grid-connected solar system in a state with a generous Solar Feed-in Tariff such as Queensland, it will make the most financial sense for you to export as much of your solar power as possible, whereas in a state with virtually no Solar Feed-in Tariff incentive (such as NSW), it makes more financial sense to self-consume as much as your solar power as possible, because allowing it onto the grid would be something of a ‘waste’. An intelligent, programmable storage system will give you the greatest amont of control over the use of the energy that you produce and store at home or in your business, allowing you to make sure that you’re using it in the most economically advantageous way possible. How do solar power storage solution technologies work? The number of solar power storage solution technologies available in Australia is limited but growing. Each one functions in a slightly different way, but the basic principle is the same: solar power can be collected in batteries for later use or to be fed into the grid, depending on the incentives. Solar power storage devices are generally comprised of a battery bank (utilising a technology such as standard-issue lead-acid or the increasingly affordable lithium-ion) and a smart inverter that can manage power in accordance with programming. The capacity of storage devices can vary by both the brand and the model of the product in question. It may even be the case that the ‘management’ portion of the technology is sold separately to the storage portion. Conventional battery banks for off-grid systems can basically be built and expanded to meet expected demand, and are managed by inverter-chargers. This can also be true of some grid-connect storage units, but generally speaking there is no reason to put together a system that will be able to supply a home or business with electricity for 3-5+ days, as may be required with an off-grid system. Instead, the surplus storage is used as a ‘buffer’ to protect the home or business from higher electricity prices, so in most cases enough storage capacity for 10-15 hours’ worth of power, depending on how it is used. Of course larger storage systems may also be used as power back-ups for systems in locations where grid reliability is shaky, or for institutions such as hospitals who need to remain fully operational even when the grid fails. Interestingly, grid-connect energy management/storage technologies need not necessarily even be attached to a distributed generation unit such as a solar PV system. Connection to the grid means that the grid can be used as a ‘generator’, and cheap, off-peak power can be used to charge up batteries and then consumed during peak periods when grid electricity is expensive. Where there is a Feed-in Tariff agreement in place, it would also be possible for a home or business to feed the stored electricity back into the grid and receive a premium payment for it–yet another opportunity to save money on electricity bills. While solar power systems are rated in kilowatts (kW), electricity storage capacity is measured in either ampere-hours (Ah, a measure commonly used in off-grid system battery banks) or kilowatt-hours (kWh, the same measure used in power bills to calculate electricity consumption as well as production). The level of storage capacity that you require will depend on how you plan to plan to use your power–simply as a back-up, or to maximise power bill savings? A useful way to look at the price of a storage unit is the price per kWh (as opposed to solar generation units, whose price is usually measured in cost per kilowatt). The lifespan of the battery component of a solar storage/management technology is usually measured in ‘cycles’. Batteries used in storage systems are called ‘deep-cycle’ batteries, and can be routinely discharged to as low as a certain percentage of their capacity–e.g. 50% or 20% (as opposed to car batteries which need to stay closer to 100% in order to function properly). Essentially, a cycle is one round of completely discharging a fully charged battery, but in practice this is avoided as much as possible, because repeated discharges this ‘deep’ can shorten the lifespan of the battery, especially for the most common and affordable battery technology available: lead-acid batteries. The second most common type of battery commercially available is the lithium-ion battery, which can be discharged more deeply a greater number of times, but still remains significantly more expensive than lead-acid, although this is changing as technology improves, aided in great part by the global development of an electric vehicle market. What solar power storage technologies are commercially available in Australia? One option available on the Australian market at the time of writing is the Netherland’s Nedap’s PowerRouter, whose modular nature allows for smart management of a small-scale renewable energy system as well as a battery bank if necessary. Another product soon to be available (from June 2012) is an Australian-made module from a prominent South Australian solar installation company. This unit is unique for a number of reasons. It is a totally self-contained energy management and storage unit that extends battery life by ‘balancing’ them, drawing on batteries as individual units–as opposed to the conventional arrangement of a ‘bank’ of batteries strung together–and thus eliminating the ‘weakest link’ syndrome that battery banks are notoriously susceptible to. One of the main objections to the broad-scale uptake of renewable energy technologies is the issue of intermittency–solar technologies only produce power when the sun is shining, wind power only generates when the wind is blowing. This is in contrast to coal and gas generation (among others), which can be ramped up and down on demand. Although there have been a number of proposed fixes to the intermittency issue (such as highly detailed weather forecasting), widespread distributed storage could be a game-changing solution that few people could have seen coming even a few years ago. The idea is gaining traction internationally (below is a video of one new proposed technology that could change everything), and it may only be a matter of time before it becomes something that we all take for granted, like we all do our current generation infrastructure. Want updates about energy storage? Fill out the form below. On the back of the success of our informative and impartial Solar Quote Comparisons, Solar Choice is currently in the process of developing an online comparison platform for energy storage solutions – for retrofit and brand new installations. If you’d like to be informed when this new service goes live, please enter your details into the form below and we will be in touch. We will also let you know when our energy storage system sizing tool is available on our website. I currently have a stand alone system with a bank of 24 lead acid batteries that are 5 years old and all test ok, is it possible to add more batteries to the current bank without causing issues to any of the batteries? We are not in need of more panels, just more storage. I’d recommend speaking to an installer or electrician about expanding the battery bank, as I’m not totally clear on how that works. I do know that it’s not generally recommended for solar panels due to the possibility of introducing ‘panel mismatch’, and believe that the same may be true of batteries. From what I understand, you’d probably be better off replacing the whole bank in one go or setting up a parallel bank alongside it – but again, best to speak to someone who is electrically qualified! If I am getting 52c a kW feed in tariff from the electricity I generate here in Brisbane is it going to be economical to have a battery storage system because at night or when I am needing more power than I am producing I can buy it around 20c a kW. Storing the power I generate and using it say at night would mean I am missing out on the high Tariff of 52c. Is it viable with all the setup costs to have a battery storage system in Brisbane? We don’t recommend that homes on a generous feed-in tariff install batteries unless they prize energy independence over financial returns – your solar energy is worth much more to you exported to the grid than if you self-consume it. Please see our article about solar + batteries in Brisbane. I’d love to get off the grid and can’t wait till the likes of liquid metal batteries become a reality for stand alone domestic use (sign me up as soon as). I acknowledge that the grid has served us well and will do in the future (even if only to top up our batteries and for emergencies) but the way these monopolies have been screwing the everyman, I can’t wait to stick it up them. It would have been nice to see mention of the newer technology lead crystal batteries here. In my opinion, vastly superior to both lead acid and Li-ion batteries. Hi Andrew. We will certainly look into this. In the meantime, you might be interested in reading this article about the various types of lithium-ion batteries. There are more out there than people think. My location is in Queensland and I have installed a 5kw solar system in 2011 now enjoying solar power bonus of $ 0.50 from Origin. This price can stand for 20 years. The solar system helps to save 50% of my consumption quarterly. As the bonus price is high it help to cover part of my evening time power expense. I am not anxious to install a battery to storage green power although I am very interest in this self-contained green power management system. When the 20 years about to run out I believe the green power storage system price should be lower substantially, as after all, after June 2013 the green power bonus has been so low that not worthy to sell back to grid and electricity price is continuous to go up each year in the big way (it is absurd! ), so go green energy is still a good option, battery should be starting popular. We can’t direct you to any particular websites as we are an impartial service and this would be showing bias. If you are in Australia and are looking to install a solar PV system, please complete the Solar Quote Comparison to the right of the page and we’ll send you details for installers in your area. Like so many ordinary Aussies who have installed small PV solar generators and observed the efficiency with which they operate, I would relish being able to drop off the grid all together. Your energy solutions which combine the advantages of maintaining grid connection in conjuncton with home generation and storage, ignore the unfair fixed charges that “big energy” attach to their accounts. These charges continue to rise and, in many cases, offset the sacrifices consumers have made in becoming more energy conservative. This creates a decidedly “uneven playing field” and is counter-productive to the incentive for consumers to become more energy frugal. How I would love to say to big energy “Enough! all ready. Your greed knows no bounds. Come and disconnect me”. The powerouter seems absurdly expensive for what it does. I was quoted an additional $6 K over a standard inverter, for a device whose basic function is just to decide whether to source power from solar, the grid, or batteries. We definitely need more competition in this segment of the market. Wait till the Chinese get onto it. A good quality inverter is essentially a smart inverter as it will manage the fluctuating energy flowing from your panels. At the moment anything associated with adding battery storage to a solar PV system is extremely expensive and it is very unlikely that there will be any Government incentives to boost this aspect of the industry. Unless we see reasons develop where the additional cost of battery storage becomes worth the cost there will not be the investment required to drive the cost of the technology down. I suspect that the Chinese market will only develop if there is a global cry for battery storage solutions but for that to happen we would need to see something akin to the gross tariff situation suggested by the Queensland Competition Authority. They suggested that solar PV owners fee everything they produced back to the grid for 8¢ per kWh and buy back all their energy at between 16-32¢ per kWh, needless to say this was widely criticised and is now a highly unlike option for the Queensland Government. We hope that answers your query. If you’re looking to instal the the battery with ‘balancing’ technology as part of a new solar PV system your best option is to complete our Solar Quote Comparison to the right of the page. We’ll be able to direct you to installers within your area that have this technology as well as getting you the best deal on the rest of your system. Alternatively you can call one of our Solar Brokers on 1300 78 72 73. Really interested in finding out about this. Next post: Cheap solar panels in Melbourne, Victoria?